Victim of state-inflicted gun violence: Jose Guerena, Jr. after seeing the dead body of his father. Guerena, a former Marine and Iraq combat veteran, was gunned down by a Pima County SWAT team who committed an illegal home invasion on the basis of a spurious search warrant. When the invaders arrived, Jose was asleep after finishing a graveyard shift at a local copper mine. It’s difficult to believe that the 26-year-old father of two would be working the graveyard shift if he had been at the center of a large marijuana smuggling operation, as the Pima County Sheriff’s Office later claimed on the basis of unalloyed speculation. The Sheriff’s Office was aware of Jose’s work schedule, because they had kept his home under surveillance for several weeks before the raid. If an arrest had been justified, it could have been carried out, using conventional means, at practically any time. In fact, the Sheriff’s Office conducted a conventional, low-profile arrest of three of his relatives. The suspects – two small women and a man well into middle age – were taken into custody by plainclothes detectives without a SWAT team laying siege to their homes. But this occurred nearly a year after the fatal SWAT assault on Guerena’s home. The Sheriff’s Office never explained why a SWAT raid was supposedly necessary in order to carry out searches that didn’t result in arrests until nearly a year later. The unspoken but obvious answer was that the raid wasn’t necessary – but it seemed like a fun and relatively low-risk outing for the armored adolescents that compose the local SWAT team. Their attitude as they approached the Guerena home doesn’t suggest that they were genuinely concerned about the possibility of danger. The officers were cheerful and light-hearted as they were decanted from their armored vehicle to inflict terror on an innocent family. After being shaken awake by his terrified wife, Jose grabbed a legally acquired AR-15 rifle and told his wife and their four-year-old son, Jose, Jr., to hide in a closet while he confronted the unidentified intruders. Within seconds of forcing their way into the home, the raiders -- who were armed with high-capacity “assault weapons” of the kind that would be banned for civilian use if Obama, Biden, Feinstein and their ilk prevail – had flung 71 rounds at Guerena. In keeping with established custom, the uniformed murderers lied by claiming that their victim had fired the first shot after growling a cinematic imprecation at the SWAT team. It was later established that Jose didn’t even disengage the safety on his rifle. He was hit with twenty-two rounds. During the assault, Vanessa called 911. Paramedics arrived on the scene in minutes. The SWAT team turned them away. According to the coroner’s report, the injuries Jose sustained were not fatal – if he had received immediate medical attention. There was at least one combat medic in the SWAT team that attacked the Guerena home. He was morally and legally required to provide aid. Doing so, however, might have posed an immeasurably small risk to that most precious of things, “officer safety” – so the team simply waited for Jose to die. One of the raiders expressed dissatisfaction with that decision -- but because he wanted to “finish” what they had started by cleanly killing off their victim, rather than doing whatever was necessary to save his life. Vanessa pleads for someone to help her husband. When a tearful and horrified Vanessa emerged from the home to plead for someone to help her husband, she was assaulted and dragged away to be interrogated without the benefit of legal counsel. Her abductors maintained the pretense that her husband was alive and getting medical assistance. After a lengthy interval, four-year-old Joel wandered out of the house. He most likely has vivid memories of seeing his father’s bloody and lifeless body on their living room floor. Jose was a peripheral figure in the narcotics investigation. The marauders who attacked the Guerena family’s home did not know what they were looking for, and found no evidence that Jose was involved in criminal activity. They most likely wanted to blackmail him into becoming an undercover asset. "Mom, was my dad a bad guy?" six-year-old Joel tearfully asked his newly widowed mother after the child -- who was at school during the shooting -- had absorbed the full horror of what had happened. "They killed my dad! Police killed my dad! Why? What did my dad do?" Vanessa assaulted by Pima County SWAT Team. Vanessa should have been offered the opportunity to tell that story before the Senate panel – and in front of the national audience commanded by the January 30 hearing. Jose, Jr., who is now six years old, might also have been able to testify. But this wouldn’t have been compatible with the purpose of the event, which was to advance a “conversation” intended to promote the disarmament of the public, with the ultimate objective of creating a government monopoly on the use of force. That disarmament program would be carried out by, among others, the state-licensed assassins who murdered Jose Guerena. For us, but not for you: Chief Johnson with ammo magazines. “Like assault weapons, high-capacity magazines are not used for hunting, and they do not belong in our homes,” proclaimed Chief Johnson. He urged the Senate to “stand with law enforcement on these common-sense public safety measures” – by which he means not a “ban” on those weapons and high-capacity magazines, but rather policies that would deny the public legal parity of weaponry with state-licensed home invaders like those who murdered Jose Guerena. 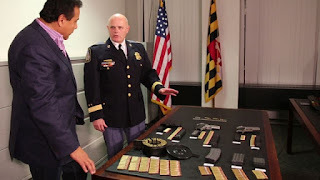 According Johnson’s biography, he began his law enforcement career “as a police cadet at the age of 18” and has been employed with the Baltimore County Police Department for more than 30 years. In addition to documenting that Johnson has never held an honest job in the productive sector, that bio implicates the Chief in the January 2005 murder of 51-year-old Cheryl Lynn Noel. During a traffic stop the previous October, Mrs. Noel’s 18-year-old son Matthew was found in possession of a plastic bag containing an unidentified “white dust.” A warrantless search of the trash outside the Noel family’s home yielded what the police described as “trace amounts” of drugs – that is, marijuana seeds -- and drug “paraphernalia.” It was at that point the police applied for a “no-knock” search warrant of the family’s home. Although her husband had a thirty-year-old conviction for second-degree murder, Cheryl Lynn – who held Bible studies in the home -- had no criminal record. However, both she and her son Jacob owned legally registered firearms. That fact was listed among the details cited to justify a “no-knock” SWAT raid to arrest her younger son Matthew on a narcotics charge. Of course, the police didn’t explain why it was “necessary” to stage a pre-dawn home invasion, as opposed to conducting a conventional arrest. 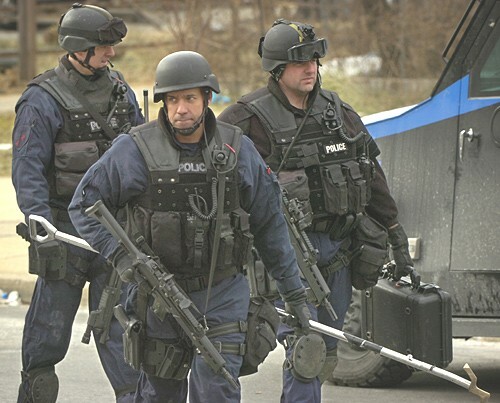 What Cheryl Lynn saw: Baltimore County SWAT operators. At 4:30 a.m. on the morning of January 21, Cheryl Lynn and her husband were startled awake by the concussion of a flash-bang grenade and the sound of a battering ram being used to force open the front door. Mrs. Noel reached for her handgun and pointed it at the bedroom door, which was forced open by a figure in battle fatigues, whose face was covered with the visor of a black ballistic helmet, and who carried a large ballistic shield. Before Cheryl Lynn could fire a shot in her own defense, the intruder – Officer Carlos Artson – fired two shots into her upper torso. Cheryl's grasp on her handgun slackened – not surprisingly, since she most likely was already dead. Artson continued his approach, yelling at Cheryl to move further away from the gun. When the victim couldn’t comply, Artson shot her a third time, administering the coup de grace from point-blank range. It’s important to point out that Matthew, who was the subject of the raid, was sleeping downstairs at the time. Even if the raid was justified – which, of course, it wasn’t – there was no need for the officers to barge into the upstairs master bedroom in order to carry out an arrest. At the time of the fatal home invasion that resulted in the murder of Cheryl Lynn Noel, then-Colonel Johnson supervised the department’s tactical unit. This means that he had “command responsibility” for the SWAT team’s actions. In June 2007, Johnson was chosen to replace Sheridan as Police Chief when the latter was appointed head of the Maryland State Police. I’m cynical enough to believe that Johnson’s promotion, like the “valor” award presented to Artson, was intended – at least in part – as a defiant gesture of contempt toward those who had condemned the murder of Mrs. Noel. The Noel family lost their case, and Artson remains at large. Last July, in a incident that was eerily similar to the murder of Cheryl Lynn Noel, Artson murdered Ronald Cox in the course of a paramilitary raid to arrest suspects in an attempted murder case. Like Mrs. Noel, Mr. Cox, the owner of the home invaded by the police, was not a criminal suspect. 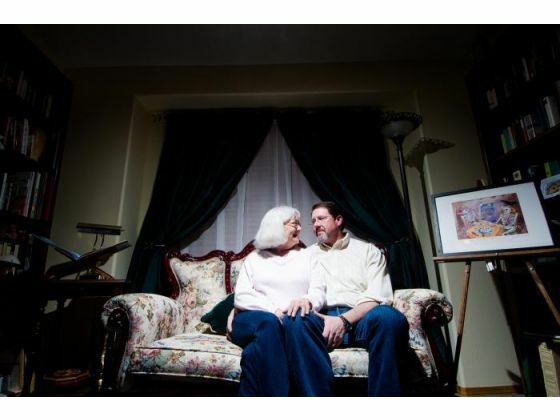 Like Mrs. Noel, he was armed when he encountered the police in his upstairs bedroom. However, he didn’t have a gun; he had what was described as a “large sword.” The police report complained that Cox had “damaged” Artson’s ballistic shield. Apparently, summary execution is appropriate punishment for Mundanes who impudently disfigure government property in that fashion. According to Clarence Dupnik – the craven, dim-witted functionary who presides over the Pima County Sheriff’s Office – about fifty SWAT raids of the kind that led to the murder of Jose Guerena occur within his jurisdiction every year, which is shocking. In Baltimore County, Chief Johnson’s Einsatzgruppen conduct more than 120 attacks of that kind annually, which are among the 1,600 military assaults carried out in Maryland each year, a figure that is genuinely horrifying. Gun-related violence by government-licensed killers is ubiquitous – and it is also a forbidden subject in the “national conversation” our rulers have orchestrated for their benefit. Once again, thank you for your continued support to help keep Pro Libertate on-line. We honestly couldn't make it without your help. God bless! Why is it a “Crime” to Disarm a Uniformed Aggressor? No, they're not ETs; they're JBTs: El Paso County SWAT operators play-act a big drug bust. That promise apparently doesn’t apply to the right of an unarmed citizen to defend himself against acts of criminal violence committed by one of Maketa’s deputies. 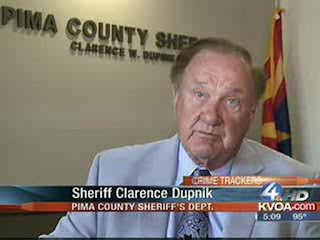 If it did, Maketa – who, like every other sheriff, has some discretion regarding prosecutions – would have urged the local prosecutor to drop all charges against Calhan, Colorado resident David Goss, a sod farmer who is now serving an unjustified four-year prison sentence for the supposed crime of trying to avoid being shot in the stomach by Deputy Jeff Schulz. On the evening of June 16, 2011, Deputy Schulz responded to a call from a woman who had been chased away by Goss after she and several friends accidentally trespassed on his farm. In the weeks leading up to that incident, Goss -- who would later be described by a trial judge as "a pillar of his community" -- had suffered a series of robberies and received no help from the Sheriff’s Office. He was sitting in his pickup at the end of a long driveway when Schulz arrived. Owing to his understandable frustration, Goss had been abrupt and inhospitable in dealing with the unwanted visitors, and his mood didn’t improve when Schulz showed up. A struggle then ensued in which the deputy – despite being larger and younger than the farmer – supposedly wound up pinned to the ground on his back as Goss repeatedly beat him with his own radio and threatened to kill him. At that point, Schulz – supposedly fearing for his life -- shot the unarmed and already traumatized farmer in self-defense. That was not to be the only version of the story told by Schulz. Furthermore, eyewitnesses to the struggle told a very different story: In their account, Schulz had drawn his gun and was struggling with Goss while firing wildly. One of the rounds struck the car being driven by Goss’s wife, who, out of concern for her husband, had come down the driveway. After shooting Goss in the stomach, Schulz attempted to shoot him again, but the gun misfired. Schulz – visibly agitated and muttering to himself — spent several minutes driving in circles in his police vehicle, without calling for an ambulance. Shulz also threatened several eyewitnesses on the scene. Confronted about his inconsistencies on the witness stand, Schulz — a paragon of self-pity who was reduced to blubbering at several points during Goss’s trial — insisted that “the situation was chaotic …. So if I don’t remember something that’s normal and typical.” Since cops are trained and given official permission to lie, self-serving perjury of this kind is, as Deputy Schulz said, entirely normal and typical. Defense attorney Geoffrey Heim produced photographs of Deputy Schulz after the incident showing that there was dust on the left leg of his trousers, but none on his back. Prosecutor Tanya Karimi dismissed that critical evidence of perjury by maintaining that Schulz was merely “mistaken” about how he had landed on the ground, and that he was on his side when the struggle took place. That version, fatally undermined the melodramatic depiction of Goss was kneeling on Schulz’s chest and beating him severely. Prior to Goss’s trial, the district attorney conducted an investigation, which – not that the suspense was unbearable – resulted in a finding that Deputy Schulz was “justified” in shooting the farmer. Ironically, that investigation turned up one significant detail that supported Goss’s defense: There was evidence that a bullet casing had not fully cleared the pistol and got jammed in the slide. The DA said that this was consistent with Schulz’s claim that Goss had tried to grab his gun. This key detail is consistent with eyewitness claims that Goss was struggling with the Schulz after the deputy had drawn his gun and was firing wildly. It also confirms that the deputy had attempted to shoot Goss a second time after already shooting him in the stomach at close range. All of this indicates that rather than trying to take Schulz’s gun and use it against him, Goss was trying to prevent the deputy from murdering him. Despite Schulz’s abundant self-contradictions, the testimony of eyewitnesses, and substantial material evidence impeaching the deputy’s claims, Goss was found guilty of second-degree assault on an officer, disarming an officer, and several other charges. At the sentencing hearing, a tearful Schulz continued to indulge his unappeasable sense of victimhood. “You caused me more pain than you can imagine,” whimpered Schulz, addressing Goss. “I have no pity for you even though I know that I should.” So vast, deep, and poignant was Schulz’s pity for himself that he could spare no sympathy for the man he had assaulted and attempted to murder. Actually, the “message” delivered by Bain and Schulz – and tacitly endorsed by Sheriff Maketa – was that when a police officer decides to murder someone, the individual targeted for that act of official violence has a duty to die. Should the victim survive the assault, he will be sent to prison. According to Goss’s family, the farmer has filed an appeal -- but this will avail them nothing, even if it succeeds. “This really seems kind of pointless, because by the time the appeal is through, David will probably have finished his sentence,” one source close to the family told Pro Libertate in an interview last summer. 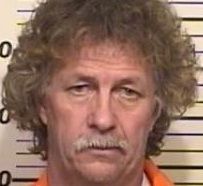 His family declines to discuss the case on record out of fear that public criticism of the Colorado “justice” system may result in a retaliatory prison assignment that could endanger the health and safety of the 54-year-old farmer. Because the purported “victim” in this matter was a police officer, Goss was taken directly from the courthouse to a cell. Not content to see his victim incarcerated, Schulz is also seeking to ruin his family financially: The deputy, who claims that he will “never recover” from the physical and psychological trauma of his encounter with Goss, has filed a lawsuit against his victim. Despite his supposedly incapacitating injuries, Schulz — a shameless perjurer whose behavior suggests a capacity for pathological violence — remains on duty. In fact, Sheriff Maketa considers Schulz a hero and exemplar: Schulz was awarded a Medal of Valor for his attempt to murder David Goss (see page 38 of the department’s 2011 Annual Report). For all of his posturing as a Second Amendment stalwart, Sheriff Maketa obviously doesn’t believe that citizens have a right to armed self-defense against government-sanctioned lethal violence. If he is willing to countenance the imprisonment of an innocent citizen whose only “crime” was to disarm a deputy who attempted to kill him, Maketa obviously isn’t going to defend the rights of a citizen who actually uses a firearm to protect himself against criminal aggression by a law enforcement officer. 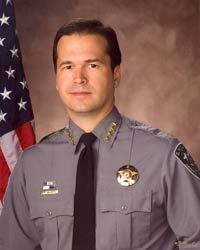 Like most sheriffs across the country, Maketa is eager to deploy SWAT teams on the flimsiest of pretexts. A few weeks ago he dispatched three SWAT operators to arrest Catherene Wilson, a five-foot-three, silver-haired, 56-year-old grandmother, who was held for five days in the El Paso County Jail because of an erroneous extradition order filed by a law enforcement agency in Orlando, Florida. The order was generated by a 35-year-old credit card conviction, for which she completed a term of five years' probation decades ago. Wilson’s husband Jim repeatedly attempted to contact Sheriff Maketa, only to be studiously ignored. With the expensive help of attorneys from Florida and Colorado, Wilson was released and the charges against her were dismissed – twelve days after she was able to document that the warrant was invalid. If the family hadn’t possessed the material resources to hire legal help, Mrs. Wilson – whose nickname is “Abuelita” (“Little Grandmother”) -- would probably still be in jail. If, on the other hand, she had tried to defend herself from the armed strangers who abducted her without just cause, Abuelita would either be dead, or headed to prison. And the sheriff who dispatched the kidnappers would probably give them a commendation. Maketa had an opportunity to take an individual meeting that description off the street. Instead, he kept him in uniform and gave him a medal. ... to everybody who has given so generously to help keep Pro Libertate up and running. It really means a lot to me and my family. It is no exaggeration to say that I couldn't continue doing this work without your help. We appreciate your kindness more than I can adequately express. Thanks once again!